NEW DELHI: A goal-fest from Hindustan FC within 30 minutes of the start of the game took away all the sheen from Bengaluru FC, as they looked hapless in a massive 4-0 win by the Delhi outfit in the final Rest of India Zone A game at the Ambedkar Stadium in the Capital on Friday afternoon. Goals from Vishal Deep, Ramthing Jajo, and a sublime brace from Dilli Ram Sanyasi made the perfect afternoon for HFC as they now jointly take the position in the top of the table with Tata Football Academy. All possible stats are tied for both teams, and the only way now to determine who qualifies will be done in lots. The HFC blitzkrieg started right from the start, and they drew first blood courtesy of Vishal in the 14th minute of the game. Jajo’s shot on goal went straight to Srijith, the BFC custodian, but he fumbled to get a hold of the ball. 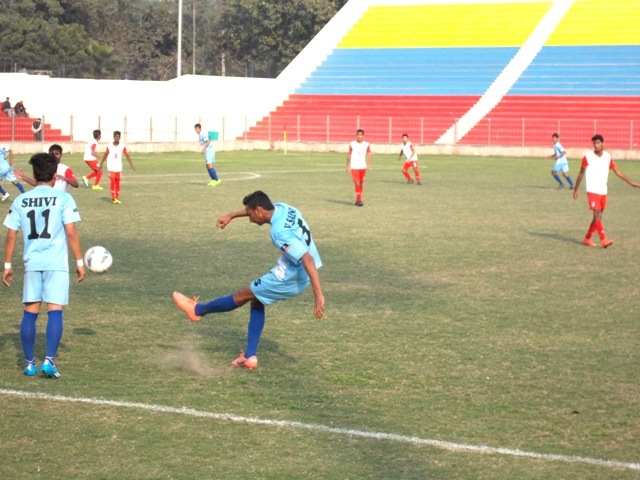 As a result, a travelling Vishal got the ball at his feet, and the midfielder had no problem in slotting it in. Off to the 16th minute and the consorted pressure from the HFC players continued. Dilli Ram got hold of a beautiful cross delivered by one of his teammates, and the lad took the shot, and fortunately moments later, it was inside the net. HFC skipper Pawan Joshi took a free kick right outside the edge of the box in the 25th minute. His shot was punched by the goalkeeper, but it fell for Dilli again, who headed home comfortably. The first half blitz halted after the 31st minute goal by Ramthing Jajo. A flurry of chances was created by HFC right from the start. Mayel Lepcha created pressure early on for the BFC defenders with the pin-point runs form the midfield and creative build-up of the attack. Following a great display in the previous match, Gagandeep Singh was marked well by the BFC defenders, who fought tooth and nail to prevent their side from recording a more dismal scoreline. In the second half, BFC regained composure after a nightmarish first half as they got a better hold on the game. In the 66th minute, Shelton Paul almost scored a goal from a difficult angle, as he got past all the defenders. However, the HFC goalkeeper marked him well and made sure his shot didn’t go past the goal. Richard Hood’s tried their level best to get back into the game, but they failed to do so. Midfielder Nirvair Nair – possibly the best player in the pitch for BFC – will be regretting not astaking any of the spectacular chances he created throughout the match.